Here in Ontario, we’re no strangers to fluctuating weather. One day it could be -20º, and the next back up to 3º. We also get all kinds of extreme weather conditions such as heavy rain, snow, extreme heat, and humidity. Cold snaps and extreme temperature fluctuations can cause your items to expand and contract, especially if they’re made of wood or metal, which can cause them to become warped or broken. Climate control means that your unit is kept at a consistent temperature, no matter what the weather’s doing outside. If you’re storing extremely valuable items such as fine art, musical instruments, vehicles, electronics, documents, or antique furniture, you need a climate controlled unit. Humidity, or excessive moisture in the air, can cause mould and mildew which can destroy fine art, and any other paper or upholstery items. Moisture can also wreak havoc on electronics, and items made of metal. Things like collectibles (stamps, coins, wine, books) can also be destroyed by humidity. When it comes to valuable or fragile items, climate controlled is the only safe way to store them. Household appliances: Moisture can cause metal parts to oxidize. Leather: Leather clothes, items, and furniture are vulnerable to cold and moisture. Photos: Photographs can fall apart or stick together in humidity and hot temperatures. Clothing: Clothing, or any other cloth items, can be affected by mould and mildew caused by moisture. Wood: Wood can be warped by extreme temperatures, or moisture. As you can see, climate control is the best choice when it comes to storing most items. Other measures you can take against climate-related damage include storing items in plastic bins, or keeping them raised on wooden pallets. However, there is no alternative to the security you get from climate control! 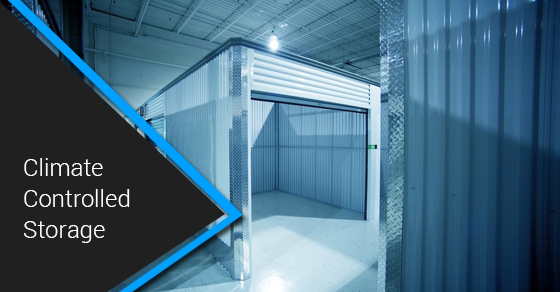 At Jiffy Self Storage, we’re pleased to offer units that are climate controlled, as well as being highly secure, fire monitored, and flood damage controlled. We give you the peace of mind knowing your belongings are safe from the elements. Contact us today for more information about renting one of our storage units.